Body made of cast iron.Epoxy Coated.Zinc Plated Spindle. This Product is also Known by it's Italian Name " Morsa Tipo Monopol Fissa". To retain our goodwill in clients' consideration, we are manufacturing and exporting an excellent range of Baby Vice Hand Tool. We are manufacturing complete range of small size vices for clamping of delicate small items. The type of vices generally used in Goldsmith workshop and show rooms, Means used by craftsman for light duty precision jobs. 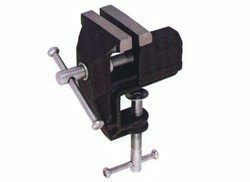 The body of vice are casted from 20-22 grade cast iron and main screw and handles are chrome plated. With hardened and knurled carbon steel jaws. We are the leading manufacturer and exporter of Baby Vice which are highly durable and corrosion resistant. 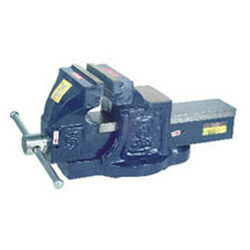 Our Hydraulic Vise is made up of stainless steel and galvanized iron which provide a premium quality and long lasting service to our customers. We offer Baby Vices Fixed Base.